Mission Church in San Diego celebrated its 100th Anniversary in October, 2015. Included in all of the festivities was the launching of Recipes of Hospitality. You can order this unique cook book by clicking on the book cover image just to the left. Recipes for Hospitality is more than just a cookbook. You see, cooking and recipes are common, yet this book of recipes is unique in several ways. 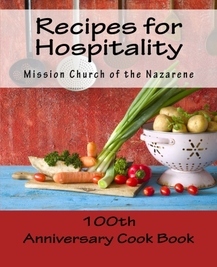 First of all, it covers a century of Mission Church cooking, with several of these recipes handed down from previous generations. Another reason for its uniqueness is that it is based on the concept of Christian hospitality. The following question was asked of church members recently: "Why did you stay at Mission Church of the Nazarene?" There was a recurring theme in the answers as people said "We were invited to someone's home for a meal following our first service, so we were loved into the church!" The Bible instructs us to "Share with the Lord's people who are in need. Practice hospitality" (Romans 12:13 NIV). And so, by adding the ingredients of love and acceptance to some fantastic and tasty foods, you have Recipes for Hospitality!